You appeal for money to save the gorillas. Very laudable, no doubt. But it doesn’t seem to have occurred to you that there are thousands of human children suffering on the very same continent of Africa. There’ll be time enough to worry about gorillas when we’ve taken care of every last one of the kiddies. Let’s get our priorities right, please! You appeal for money to save the gorillas. Very laudable, no doubt. But it doesn’t seem to have occurred to you that there are thousands of aardvarks suffering on the very same continent of Africa. There’ll be time enough to worry about gorillas when we’ve saved every last one of the aardvarks. Let’s get our priorities right, please! This second letter could not fail to provoke the question: What’s so special about aardvarks? A good question, and one to which we should require a satisfactory answer before we took the letter seriously. Yet the first letter, I suggest, would not for most people provoke the equivalent question: What’s so special about humans? As I said, I don’t deny that this question, unlike the aardvark question, very probably has a powerful answer. All that I am criticising is an unthinking failure to realise in the case of humans that the question even arises. The speciesist assumption that lurks here is very simple. Humans are humans and gorillas are animals. There is an unquestioned yawning gulf between them such that the life of a single human child is worth more than the lives of all the gorillas in the world. The ‘worth’ of an animal’s life is just its replacement cost to its owner — or, in the case of a rare species, to humanity. But tie the label Homo sapiens even to a tiny piece of insensible, embryonic tissue, and its life suddenly leaps to infinite, uncomputable value. This way of thinking characterises what I want to call the discontinuous mind. We would all agree that a six-foot woman is tall, and a five-foot woman is not. Words like ‘tall’ and ‘short’ tempt us to force the world into qualitative classes, but this doesn’t mean that the world really is discontinuously distributed. Were you to tell me that a woman is five feet nine inches tall, and ask me to decide whether she should therefore be called tall or not, I’d shrug and say ‘She’s five foot nine, doesn’t that tell you what you need to know?’ But the discontinuous mind, to caricature it a little, would go to court (probably at great expense) to decide whether the woman was tall or short. Indeed, I hardly need to say caricature. For years, South African courts have done a brisk trade adjudicating whether particular individuals of mixed parentage count as white, black or coloured. The discontinuous mind is ubiquitous. It is especially influential when it afflicts lawyers and the religious (not only are all judges lawyers; a high proportion of politicians are too, and all politicians have to woo the religious vote). Recently, after giving a public lecture, I was cross-examined by a lawyer in the audience. He brought the full weight of his legal acumen to bear on a nice point of evolution. If species A evolves into a later species B, he reasoned closely, there must come a point when a mother belongs to the old species A and her child belongs to the new species B. Members of different species cannot interbreed with one another. I put it to you, he went on, that a child could hardly be so different from its parents that it could not interbreed with their kind. So, he wound up triumphantly, isn’t this a fatal flaw in the theory of evolution? But it is we that choose to divide animals up into discontinuous species. On the evolutionary view of life there must have been intermediates, even though, conveniently for our naming rituals, they are usually extinct: usually, but not always. The lawyer would be surprised and, I hope, intrigued by so-called ‘ring species’. The best-known case is herring gull versus lesser black-backed gull. In Britain these are clearly distinct species, quite different in colour. Anybody can tell them apart. But if you follow the population of herring gulls westward round the North Pole to North America, then via Alaska across Siberia and back to Europe again, you will notice a curious fact. The ‘herring gulls’ gradually become less and less like herring gulls and more and more like lesser black-backed gulls until it turns out that our European lesser black-backed gulls actually are the other end of a ring that started out as herring gulls. At every stage around the ring, the birds are sufficiently similar to their neighbours to interbreed with them. Until, that is, the ends of the continuum are reached, in Europe. At this point the herring gull and the lesser black-backed gull never interbreed, although they are linked by a continuous series of interbreeding colleagues all the way round the world. The only thing that is special about ring species like these gulls is that the intermediates are still alive. All pairs of related species are potentially ring species. The intermediates must have lived once. It is just that in most cases they are now dead. The lawyer, with his trained discontinuous mind, insists on placing individuals firmly in this species or that. He does not allow for the possibility that an individual might lie half-way between two species, or a tenth of the way from species A to species B. Self-styled ‘pro-lifers’, and others that indulge in footling debates about exactly when in its development a foetus ‘becomes human’, exhibit the same discontinuous mentality. It is no use telling these people that, depending upon the human characteristics that interest you, a foetus can be ‘half human’ or ‘a hundredth human’. ‘Human’, to the discontinuous mind, is an absolute concept. There can be no half measures. And from this flows much evil. The word ‘apes’ usually means chimpanzees, gorillas, orang-utans, gibbons and siamangs. We admit that we are like apes, but we seldom realise that we are apes. Our common ancestor with the chimpanzees and gorillas is much more recent than their common ancestor with the Asian apes — the gibbons and orang-utans. There is no natural category that includes chimpanzees, gorillas and orang-utans but excludes humans. The artificiality of the category ‘apes’, as conventionally taken to exclude humans, is demonstrated by Figure 7.1. This family tree shows humans to be in the thick of the ape cluster; the artificiality of the conventional category ‘ape’ is shown by the stippling. In truth, not only are we apes, we are African apes. The category ‘African apes’, if you don’t arbitrarily exclude humans, is a natural one. The stippled area in Figure 7.2 doesn’t have any artificial ‘bites’ taken out of it. ‘Great apes’, too, is a natural category only so long as it includes humans. We are great apes. All the great apes that have ever lived including ourselves, are linked to one another by an unbroken chain of parent-child bonds. The same is true of all animals and plants that have ever lived, but there the distances involved are much greater. Molecular evidence suggests that our common ancestor with chimpanzees lived, in Africa, between five and seven million years ago, say half a million generations ago. This is not long by evolutionary standards. Happenings are sometimes organised at which thousands of people hold hands and form a human chain, say from coast to coast of the United States, in aid of some cause or charity. Let us imagine setting one up along the equator, across the width of our home continent of Africa. It is a special kind of chain, involving parents and children, and we will have to play tricks with time in order to imagine it. You stand on the shore of the Indian Ocean in southern Somalia, facing north, and in your left hand you hold the right hand of your mother. In turn she holds the hand of her mother, your grandmother. Your grandmother holds her mother’s hand, and so on. The chain wends its way up the beach, into the arid scrubland and westwards on towards the Kenya border. The daughter that she is holding in her right hand is the one from whom we are descended. Now the arch-ancestress turns eastward to face the coast, and with her left hand grasps her other daughter, the one from whom the chimpanzees are descended (or son, of course, but let’s stick to females for convenience). The two sisters are facing one another, and each holding their mother by the hand. Now the second daughter, the chimpanzee ancestress, holds her daughter’s hand, and a new chain is formed, proceeding back towards the coast. First cousin faces first cousin, second cousin faces second cousin, and so on. By the time the folded-back chain has reached the coast again, it consists of modern chimpanzees. You are face to face with your chimpanzee cousin, and you are joined to her by an unbroken chain of mothers holding hands with daughters. 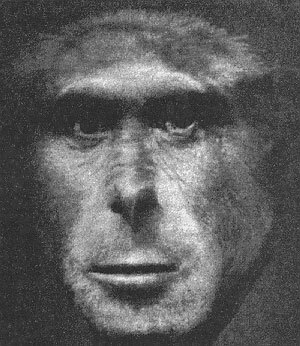 If you walked up the line like an inspecting general -past Homo erectus, Homo habilis, perhaps Australopithecus afarensis –and down again the other side (the intermediates on the chimpanzee side are unnamed because, as it happens, no fossils have been found), you would nowhere find any sharp discontinuity. Daughters would resemble mothers just as much (or as little) as they always do. Mothers would love daughters, and feel affinity with them, just as they always And this hand-in-hand continuum, joining us seamlessly to chimpanzees, is so short that it barely makes it past the hinterland of Africa, the mother continent. It is sheer luck that this handful of intermediates no longer exists. (‘Luck’ from some points of view: for myself, I should love to meet them.) But for this chance, our laws and our morals would be very different. We need only discover a single survivor, say a relict Australopithecus in the Budongo Forest, and our precious system of norms and ethics would come crashing about our ears. The boundaries with which we segregate our world would be all shot to pieces. Racism would blur with speciesism in obdurate and vicious confusion. Apartheid, for those that believe in it, would assume a new and perhaps a more urgent import. But why, a moral philosopher might ask, should this matter to us? Isn’t it only the discontinuous mind that wants to erect barriers anyway? So what if, in the continuum of all apes that have lived in Africa, the survivors happen to leave a convenient gap between Homo and Pan? Surely we should, in any case, not base our treatment of animals on whether or not we can interbreed with them. If we want to justify double standards – if society agrees that people should be treated better than, say, cows (cows may be cooked and eaten, people may not) – there must be better reasons than cousinship. Humans may be taxonomically distant from cows, but isn’t it more important that we are brainier? Or better, following Jeremy Bentham, that humans can suffer more – that cows, even if they hate pain as much as humans do (and why on earth should we suppose otherwise? ), do not know what is coming to them? Suppose that the octopus lineage had happened to evolve brains and feelings to rival ours; they easily might have done. The mere possibility shows the incidental nature of cousinship. So, the moral philosopher asks, why emphasise the human/chimp continuity? Yes, in an ideal world we probably should come up with a better reason than cousinship for, say, preferring carnivory to cannibalism. But the melancholy fact is that, at present, society’s moral attitudes rest almost entirely on the discontinuous, speciesist imperative. This arresting picture is hypothetical. But I can assert, without fear of contradiction, that if somebody succeeded in breeding a chimpanzee/ human hybrid the news would be earth-shattering. Bishops would bleat, lawyers would gloat in anticipation, conservative politicians would thunder, socialists wouldn’t know where to put their barricades. The scientist that achieved the feat would be drummed out of politically correct common-rooms; denounced in pulpit and gutter press; condemned, perhaps, by an Ayatollah’s fatwah. Politics would never be the same again, nor would theology, sociology, psychology or most branches of philosophy. The world that would be so shaken, by such an incidental event as a hybridisation, is a speciesist world indeed, dominated by the discontinuous mind. Nevertheless, it must be conceded that this book’s proposal to admit great apes to the charmed circle of human privilege stands square in the discontinuous tradition. Albeit the gap has moved, the fundamental question is still ‘Which side of the gap?’ Regrettable as this is, as long as our social mores are governed by discontinuously minded lawyers and theologians, it is premature to advocate a quantitative, continuously distributed morality. Accordingly, I support the proposal for which this book stands. New York: St. Martin’s Griffin, pg. 81-87, publicado originalmente em 1993.